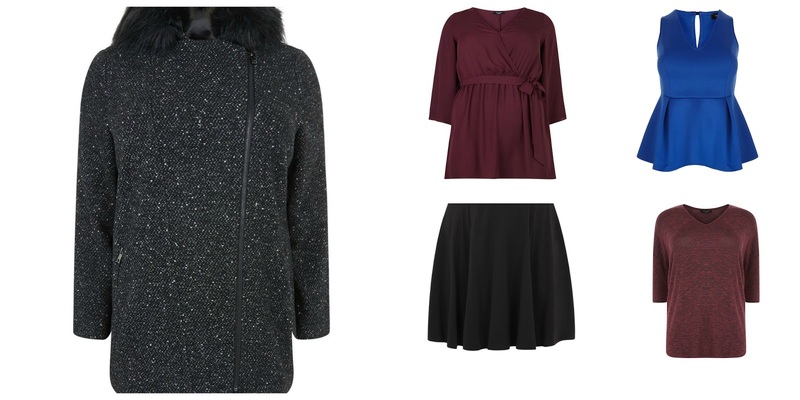 I've been on the look out for some fab autumn/winter pieces recently and have found some great items in New Look with their plus size range and wanted to share with you 5 items I'm loving at the moment. This parka is perfect for winter. I need a new coat and feel this one would work really well as it's black it will go with most items in my wardrobe and would keep me cosy and warm. It's £49.99 which is a bit pricey but I feel coats are an investment piece for this time of year. I like how it's a versatile skirt, It's an elasticated fitted waist which I feel looks great. I love skater skirts over the top of leggings for autumn - add a good pair of boots and sorted! Now that parka looks so comfy and warm, I'm absolutely freezing at the moment so would love that. The burgundy bell sleeved top is gorgeous and is the perfect hue for autumn! Oh now I love the skater skirt - it looks fab and I would team it with patterned tights and some boots. I love that blue peplum top, the colour is gorgeous! I like the belted top a lot and the color would be perfect for Autumn. The blue top is definitely cute too! Great choices! I went into New Look at the weekend - They have some seriously gorgeous bit for AW16 it was so hard not to get too much from them. Great choices. I love the parka. Its worth spending that little bit more for a decent coat! Oh these are perfect autumn colours! Love the blue scuba peplum top! Been loving peplum too much these days! I am loving all the comfy clothes choices this autumn and these look great value too. So many good autumn picks, I would love these myself! The skirt looks lovely. Burgundy is one of my favourite colours too so I love seeing it on clothing for autumn. Fab selection! New Look have some lovely items, i've just ordered a coat from there. Ooo gorgeous and affordable picks for winter/autumn here! I love inter shopping! Oh great choices - I love parka especially perfect for cold days! I'm a huge fan of New Look fashion, it is affordable and I love the styles. I think they are great. You have chosen stylish pieces. A parka is a great investment, 4 years down the line and I still reach for mine! Great picks! The parka is really great for keeping warm in the cold. I always love burgundy, especially clothes wise! I love the coat too! Great choices for Autumn, that parka is just what I need i'm feeling the cold now. I really need a parka! I could use something that is thicker than my current jackets! I love burgundy top - perfect shade for this time of year. Great Picks for winter and affordable ones too!! I need to do some shopping! !